I would to welcome everyone visiting from Splish Splash Stash's In Hand EPP Link Party (and everyone else who may be reading this). Because I haven't posted anything for the party before I am going to do a complete summary of my English Paper Piecing project. I started with a jelly roll of batiks, and found some easy to print/cut out papers from Texas Freckles. 1 inch hexagons started to be formed very very slowing from 2.5 inch squares cut from the jelly roll. Some days only 3 or 4 would get basted. 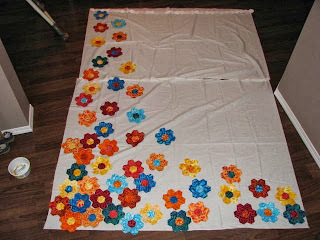 Let's just say between February and June I managed to basted roughly 300 hexies in assorted colors from the jelly roll. Once I had all the flowers done it was time for decisions. 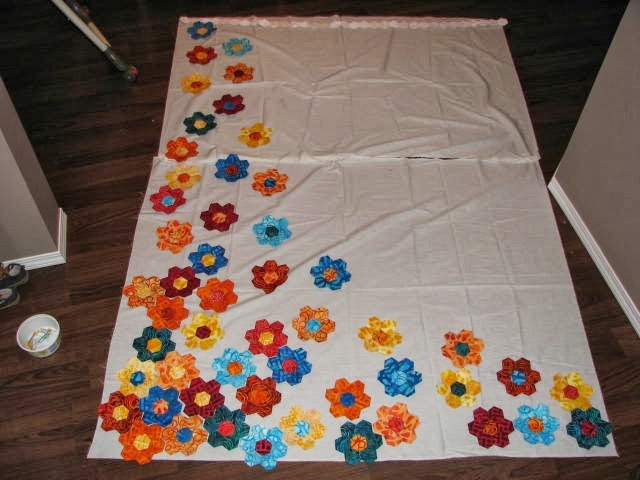 Would I applique the flowers onto a background or keep going doing EPP. I have a bit of a 'Go Big or Go Home' attitude so basting ~1500 white-on-white hexies seemed like a good idea. I basted and basted and basted. Then I went away for a weekend and had no papers cut and ready to go, so I decided it was time to start stitching some together. I made strips of 10, then joined them into rows. When I got back I was having so much fun that I kept going and put the first 3 rows together. Inserting the first flower along the way. Then it was time to fix what I had thought was a problem with the design on wall for 2 months. When I pictured the layout, I pictured the flowers falling towards the lower left corner, and with the original layout they would have been falling to the lower right. (Silly right, but I had to fix it, it was driving me crazy). 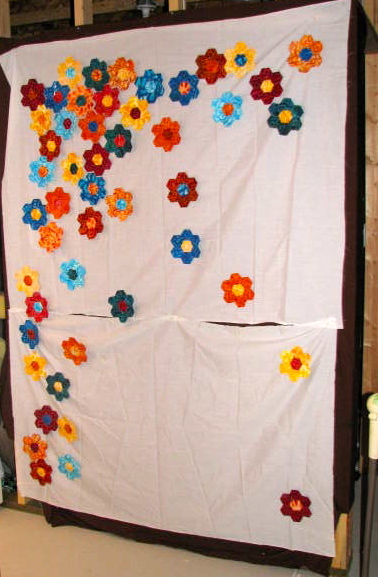 Since I was happy with the layout on the design wall, I thought I should probably finish basting the white hexies. I am using so many different white prints that I didn't think it would be wise to get too eager sewing them together before I had enough and risk having a whole section with the same 2 or 3 prints when I reach the end of the supply. So this is where I am at now. 2 trays of white on white hexies basted for a total of 1034. Add in the 364 colored ones, brings it is nice big total of 1398. I think I need 1850 plus some ~100 half hexies. All of the these numbers seem totally attainable, and not in the far far away future. Thanks for stopping in. That's looking pretty sweat. I love how the projects that are really worth doing take a lot of time, planning and attention. Thanks. Its like your tiny little beads with tons of colors. So awesome. Thanks for hosting In Hand, what a great idea. That awsome quilt! I do love the assymetric look! Oh my gosh that is a lot of white hexies!!!!! And wow your quilt is beautiful. I have never been a fan of grandmother garden and when I saw your title I though ok, cool, then I saw the next pictures and thought well this looks like GMG, then I got to the next picture and though WOW, this looks beautiful!! Have you thought about how you will quilt it. Visiting from In Hand linky party. Happy sewing! Thanks, I love the idea of hexies flowers, but traditional arrangements of them don't suit my taste at all. 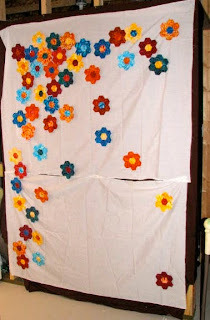 As for quilting I want to get some time on a longarm and do around each flower and then echo outward. Maybe some butterflies and dragonflies in the white background. I am a ways from that point though. you made a gazilion of white hexies. It will worthwhile. This is a beautiful design! Holy white hexies!!! I love non tradition designs for hexies, and yours is definitely a favorite. My mind is spinning with ideas! Thanks so much for the inspiration and good luck with all the stitching! Just take it one row at a time and you'll get there!!! Glad I could give provide some inspiration. Right now I am just working on basting one fat quarter into hexies at a time. Then I will think 1 row at a time. This is amazingly beautiful....makes me want to learn how to EPP! EPPing is easy, and very very portable. I do it while my kids snack or watch cartoons. this is amazing - so many hexies! WOW! You're more insane than I am!! What a ton of white hexies. I love your layout for your flowers. Thank you. You might call it insane, but for my own sanity I am calling it persistent. OMGoodness, you have your work cut out for you, but it will be beautiful! Thank you. It has been alot, but it is enjoyable. What a great project! I love your go big or go home attitude. Those white hexies are awesome. It will be so beautiful! My hexie project is much smaller (around 1200 maybe?) but I am enjoying the whole process. 1200 is still a big project. It takes dedication to keep going. Wow ...don't think I've ever seen so many hexies...great work.